ON THE GRAPEVINE: Champagne or is It? Today is Valentine's Day and I guess there will be a considerable amount of Champagne drunk. But will it be real Champagne? There was a time when any sparkling white wine from most anywhere was called Champagne. With a few exceptions that practice has now been stopped and the real stuff can only come from the Champagne region of France produced under the rules of that appellation. Let's look at some of the processes for making a sparkling wine. The initial step is to select a single wine or blend (Chardonnay, Pinot Noir, Pinot Meunier etc.) that has been specifically made for sparkling wine production. Usually it is white but can be pink. This is called the base wine. Bubble carbon dioxide through the base wine in a refrigerated pressure tank. 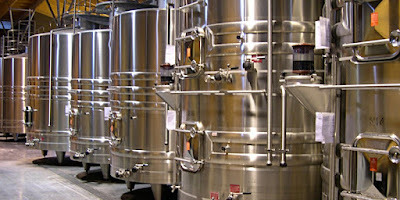 Place base wine in a refrigerated pressure tank, add sugar and yeast. The yeast ferments the sweetened wine. 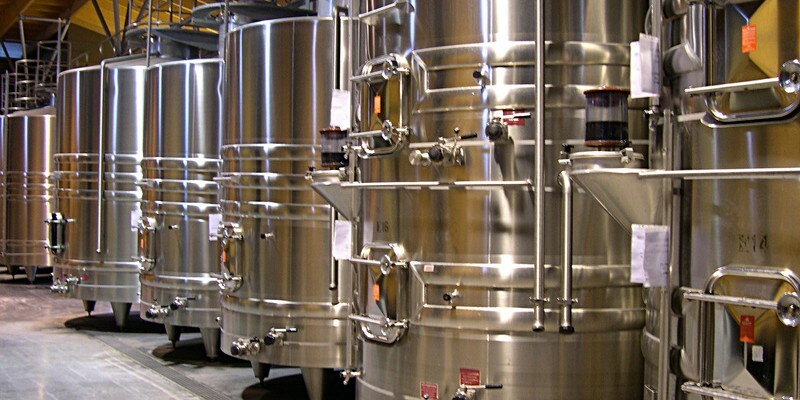 The carbon dioxide evolved from this secondary fermentation is absorbed by the cold wine. This is called the Charmat Process. After secondary fermentation occurs in the sealed bottle, the now sparkling wine is transferred under pressure to a tank. Bottle (in a different bottle). This is called the Transfer Process. Yeast and sugar are added to the base wine in the bottle it will be eventually sold in. After some time, the bottle is manually turned in a rack twice daily and gradually brought to the upright position (neck down). The lees from the fermentation process eventually settle in the neck of the bottle leaving the remaining wine clear. 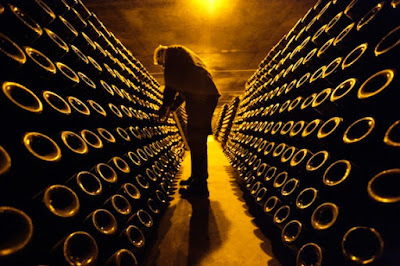 This is called remuage (riddling) and takes about 3 weeks. The bottle is then topped up with some of the same wine and a sugar/wine solution. This is called dosage or liqueuring. Bottle is corked and wired although at least one Australian producer now uses a crown seal. This process is called Methode Champenoise or Methode Traditionnelle (traditional method). It should be pointed out here that only Champagne can be legally labelled Methode Champenoise. Producers of similarly produced sparkling wines elsewhere usually use the term Methode Traditionnelle or Traditional Method. Spain uses Cava, Italy designates it Spumante and South Africa uses Cap Classsique. An Italian sparkling wine made from the Muscat grape uses the DOCG, Asti and from the Glera grape the DOCG, Prosecco. In Germany, Sekt is a common sparkling wine. There are also semi sparkling wines ie. wines made with less bottle pressure. These include the German spritzig, Italian frizzante and French pétillant wines. Australia, Italy and Moldova produce red sparkling wines. In Australia, these are often made from Shiraz.